On Saturday night at the Tiancheng International Auctioneer sale in Hong Kong, the final lot of the night — Lot 223 — featured perfectly matched miniature jadeite bangles, barely two inches in diameter. Displaying a bright emerald green color and fine texture, the bangles were translucent and showed no veins, blemishes or streaks. They were so perfect that, to the untrained eye, the rare jadeite could be mistaken for costume jewelry or a kid’s party favor. But the bidders this night knew they had a chance to own something very, very special. When the gavel crashed down a few minutes later, the jadeite bangles had been sold to a phone bidder for an astonishing $5.86 million. In explaining the high price, auction officials noted that the matching bangles were not only of superior quality, but they were carved from an unusually large, extraordinarily rare, single piece of unblemished rough material. In Eastern cultures, top-quality jadeite (the rarest form of jade) is coveted in the same way Western cultures prize gold and diamonds. As the best jadeite mines of Burma (also known as Myanmar) have become depleted, top-grade jadeite has become increasingly rare in the marketplace. The result is skyrocketing prices for the finest specimens. According to the International Color Stone Association, the value of jadeite is determined according to its color, the intensity of that color, its vivacity and texture, and its clarity and transparency. 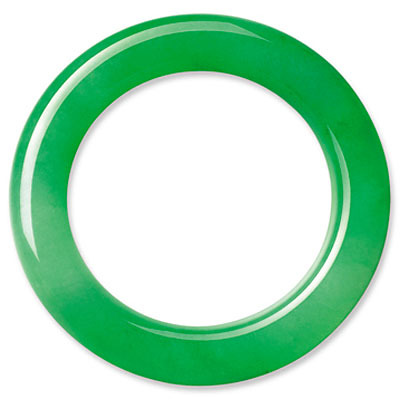 In the finest jadeite, the color is evenly distributed, as seen in the auctioned bangles. When we think of “jade,” we usually visualize varying nuances of green, but the gem also comes in shades of white, grey, black, yellow, orange and violet. As early as 3000 B.C., the Chinese had a special name for jade. They called it “yu,” the “royal gem,” in an uncanny foreshadowing of an auction result 5,000 years later that would yield a king’s ransom.